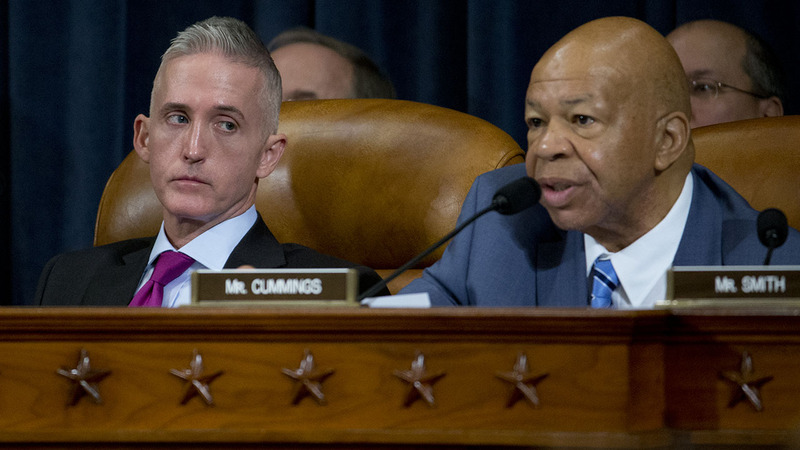 WASHINGTON -- The House Benghazi Committee, in a politically charged report, faulted the military on Tuesday for responding too slowly to send help to Benghazi, Libya, during the deadly 2012 attacks despite clear orders from President Barack Obama and the Pentagon. Republicans have repeatedly criticized the response as a serious failure by the Obama administration and by Hillary Clinton, who was secretary of state at the time and now is the presumptive Democratic nominee for president. The panel's chairman, Rep. Gowdy, R-S.C., said the report was not aimed at Clinton, though Democrats have accused the panel's Republican majority of targeting her throughout. Republicans on the panel released the 800-page report on the attacks that killed four Americans, including U.S. Ambassador Chris Stevens. "Nothing was en route to Libya at the time the last two Americans were killed almost eight hours after the attacks began," Gowdy said at a news conference. ." The report documents that the U.S. was slow to send help to the Americans "because of an obsession with hurting the Libyans' feelings," he said. The report also portrays a "series of heroic acts" by Americans under attack." Military leaders have testified repeatedly that they didn't have intelligence information on what was happening or the resources on alert to respond in time to the two attacks, hours apart. The Libya attacks became immediate political fodder, given their timing in the weeks before Obama's re-election, and that has not abated despite seven previous investigations. There has been finger-pointing on both sides over security at the U.S. diplomatic outpost in Benghazi and whether the White House initially tried to portray the assault as a protest over an offensive, anti-Muslim video, instead of a calculated terrorist attack. The GOP report offers no major revelations, but that won't quiet the criticism of Clinton from conservatives, likely Republican rival Donald Trump and other detractors. In response to the report, Clinton's campaign said it had "not found anything to contradict the conclusions of the multiple, earlier investigations." Committee Democrats released their own report Monday saying that while the State Department's security measures in Benghazi the night of Sept. 11, 2012, were "woefully inadequate," Clinton never personally turned down a request for additional security. Democrats said the military could not have done anything differently that night to save the lives of the Americans. On Tuesday, the panel's Democrats denounced the Republicans' report as "a conspiracy theory on steroids - bringing back long-debunked allegations with no credible evidence whatsoever." The statement added: "Republicans promised a process and report that was fair and bipartisan, but this is exactly the opposite." The State Department also issued a statement Tuesday, saying that the "essential facts" of the attacks "have been known for some time," and have been the subject of numerous reviews, including one by an independent review board. Spokesman Mark Toner said the department had implemented most of the recommendations of the independent review board and was continuing to expand security at its facilities and improve its threat assessment. "We have made great progress toward making our posts safer since 2012," Toner said in a statement. "Our priority continues to be carrying out our national security mission while mitigating the risks to our employees." Toner said the department cooperated extensively with the House panel, providing more than 50 current and former employees for interviews and over 100,000 pages of documents. Rep. Jim Jordan, R-Ohio, who helped write the Republican report, told CNN that "too little effort was made to protect" Stevens and the others. "We didn't move heaven and earth to get help to the people who were fighting for their lives," he said.